One of the latest Victory models revamped for the 2009 lineup is the notorious Hammer S. A muscle bike characterized by faultless custom design and backed up by a massive V-Twin engine this is Victory’s way of getting the best out of American muscle cars and transposing it into motorcycles. 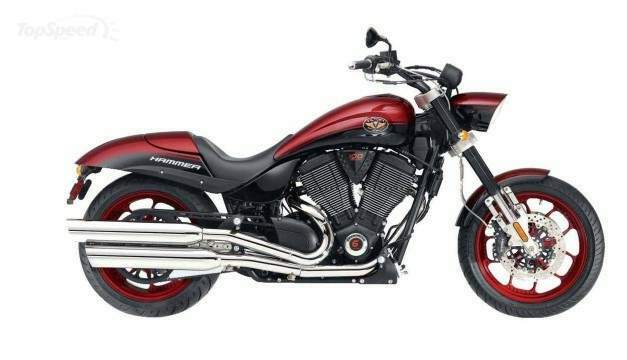 The thing with Victory motorcycles in generally is that by being relatively new on such a competitive and continuously growing market, they must feature absolute top notch features in order to get the appreciation that consecrated brands effortless obtain. Although, from our point of view Victory has long passed that critical point and is indeed a well played card by Polaris Industries, the 2009 Hammer S pushes further the boundaries of style and performance. For starters, get hold of those x-factor custom wheels and that custom paintjob. These are the shiny new bits that get our attention in the first place, but the 106-CI 50° V-Twin engine is also impossible to pass unnoticed. Displacement has been upgraded from 100-CI (1634cc) to 106-CI (1731cc), resulting into a 9.4:1 compression ratio (previously 8.7:1) and the powerplant also gets a different, tow-into-one exhaust, not only to mark the upgrade, but to retune the power range. Victory first introduced the Hammer S in 2007 as a stand-out machine that was entirely based on the simple Victory Hammer model which first made an entry in 2005. The idea was to offer diversity and slightly stand apart from that classic, chromed look so that was achieved with the use of a blacked-out 100-CI four-stroke 50° V-Twin engine, handlebars, gauges and inverted forks. The red, power-coated Gatlin wheels were supplied by Performance Machine, but the new Hammer model also stood out thanks to a custom-inspired headlight. The 2008 Victory Hammer S was all about Black. Despite not being the subject of a major revamp as it was only a year old, the custom bike featured Black/Silver with SS Stripe coloring while the Performance Machine wheels were now black translucent powdered coated. The 2009 Victory Hammer S is mostly about looks and comfort so that was the design team’s task when turning to their previous schemes. But what is so outstanding is the fact that even though at a first glance you would think that they’ve changed everything, the fact is that they haven’t changed anything, but colors. The 2009 model year features an easy remarkable Blue and White color combination in a strong contrast with the Matte Black mechanics. Do you know how those competition stripes applied on bright painted custom cars make them stand out from the crowd? 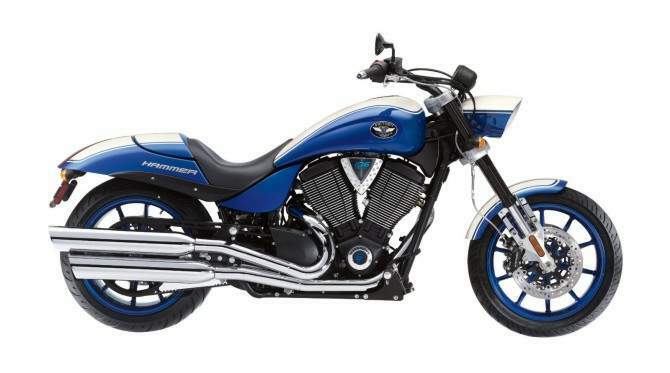 Well, this is the same kind of magic adapted by Victory for the 2009 Hammer S. So on the sides of the fenders and gas tank as well as on the lower half of the headlight, they’ve applied that awesome Blue while the top is a simple White with stylish contour lines. The wheels haven’t been excluded from this treatment so they are entirely covered in that very same Blue. The rider seats on a spacious seat and the cowl can be easily removed in order for a passenger to find its place on that rear seat. Overall a low, sleek and mean looking bike, the 2009 Victory Hammer S indeed stands away from its competitors, just like custom made cars. 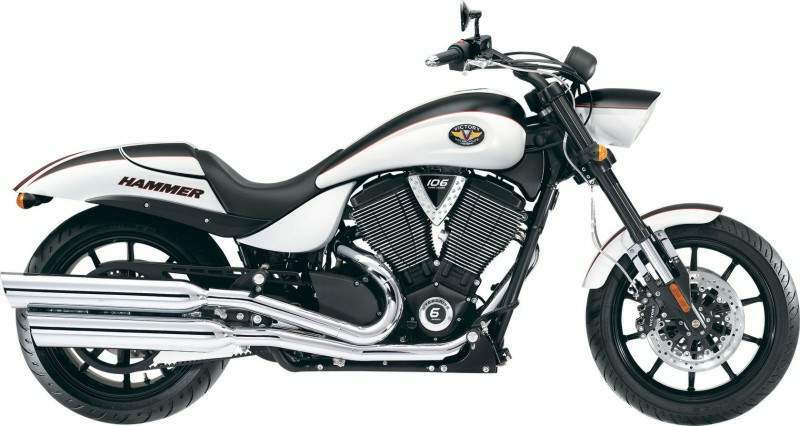 Victory turned the expected into the unexpected as nobody ever could imagine the all Black 2008 model ending up into a worm colored, but still aggressive motorcycle. And with the evolved, now 106-CI (1731 cc), V-Twin engine created to back up those looks, the 2009 Hammer S is an unbeatable package with much more left to prove during a future test drive.